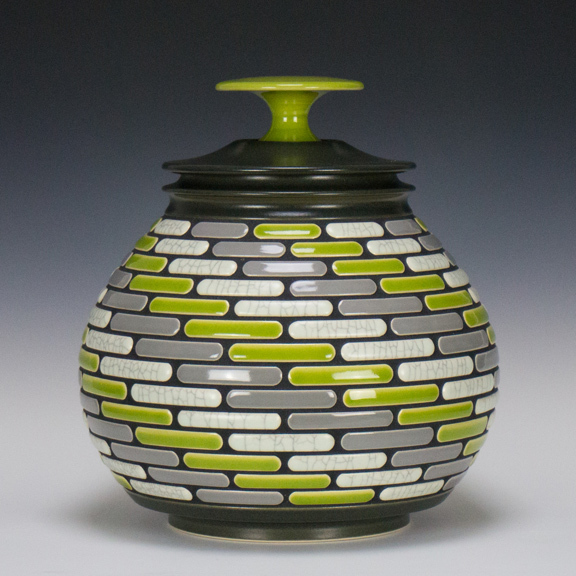 Ceramic artist Gregg Rasmusson's colorful creations are all about the pattern. Photography courtesy of Gregg Rasmusson. This is the art that Gregg Rasmusson builds: precise, linear and symmetric. 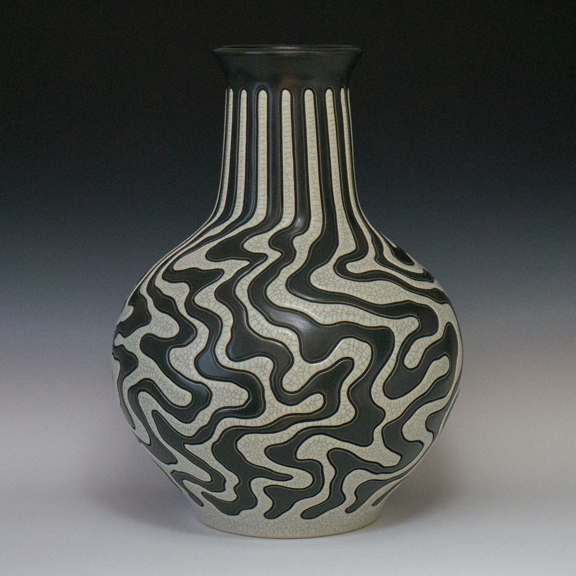 The sharp lines that repeat across his ceramic pieces are purposeful and unhesitating, creating patterns that are as much architectural as they are artistic. It is no surprise that Rasmusson’s first career was as a home remodeler; each piece is made with workmanlike detail. Also, grout. Rasmusson gains inspiration for his pieces from the world around him. “I see patterns everywhere, in malls, in nature, in kitchen tile,” he says. He begins by throwing white stoneware clay on his wheel. Once the clay has dried slightly, he trims it to its final shape. A laser helps him align the pattern on the pot, but Rasmusson performs all of the actual carving by hand. 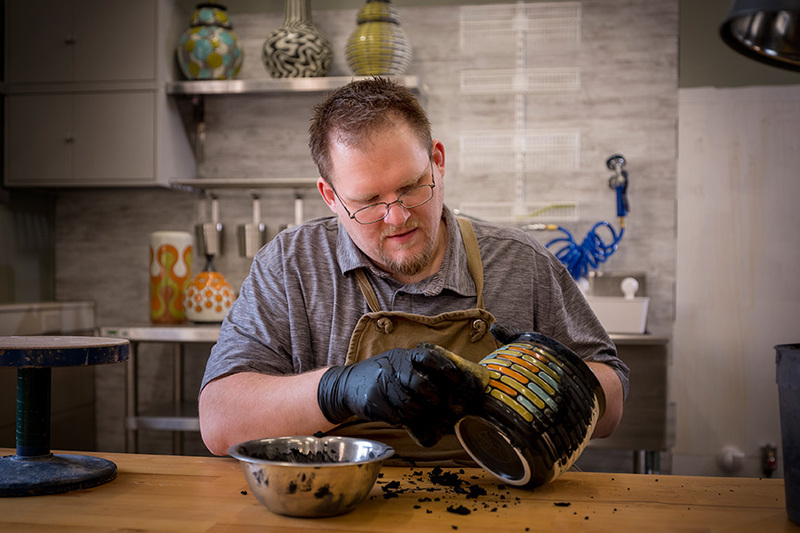 The pot dries thoroughly, is fired and then Rasmusson sprays on his glazes, using wax to separate the colors. He makes many of his own glazes, experimenting with shades and formulas over the winter in preparation for the next year’s warm-weather art shows. For the final stage, Rasmusson fills in the carved lines with black grout. The matte grout adds dimension, “pops” the contrasting glaze colors and gives Rasmusson’s pieces their signature look. What’s next? Rasmusson is expanding his collection to include decorative tiles. Made from slabs of clay that haven’t been thrown on the wheel, decorative tiles can be hung on walls or displayed on a tabletop stand. Rasmusson thanks his parents Dennis and Mary for their support in helping him realize his dream of making art, which he creates in a studio that he finished himself. 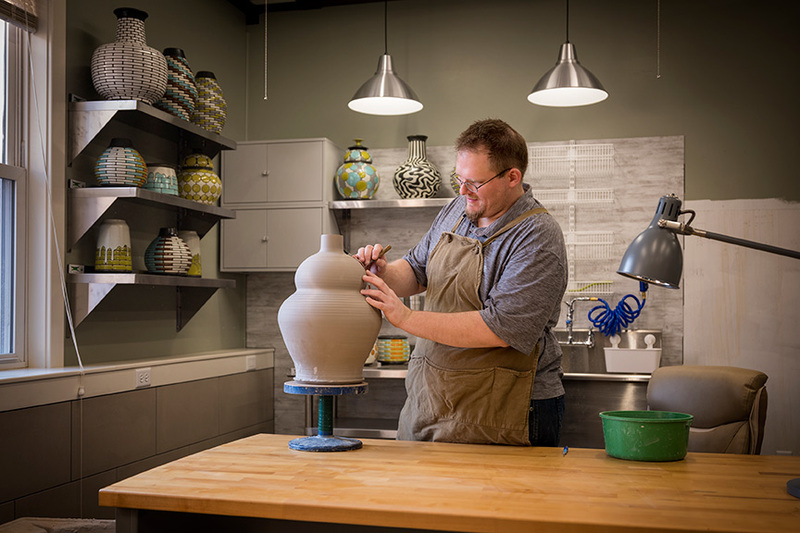 He will offer adult ceramics classes and private lessons in the studio this summer. He is also holding an open house at the studio on May 19 and 20. Rasmusson’s pieces will also appear in many juried art fairs this summer. 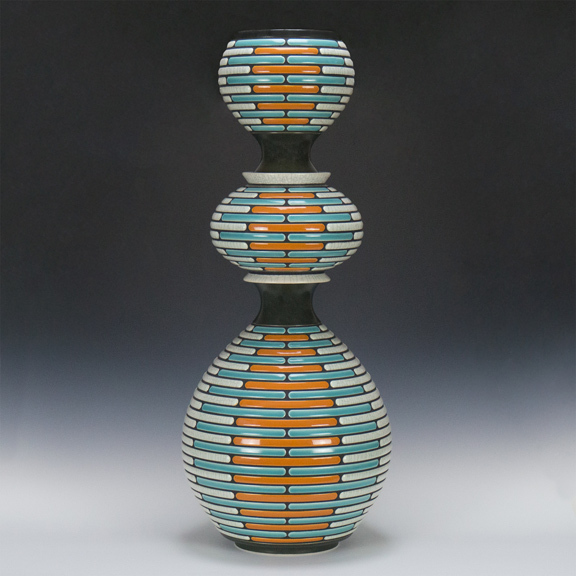 For more information, visit grceramics.com or follow him on Instagram at gregg_rasmusson_ceramics.